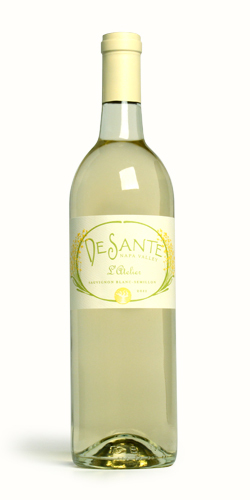 The DeSante 2018 L’Atelier is a celebration of summer with its aromas of nectarine, key lime and green gage plum. The palate shows a deft balance with its crisp spiced apple and peach flavors turning gently to a succulent finish of bruleéd red grapefruit. For a wine, this is a fancy balancing act of fresh acidity turning to a richly textured finish. Our 2018 is a blend of the following organic farmed (CCOF) grapes: Semillon 30%, Pinot Blanc 30%, Chardonnay 30%, Sauvignon Blanc 10%.